This is my last full day in Ireland. 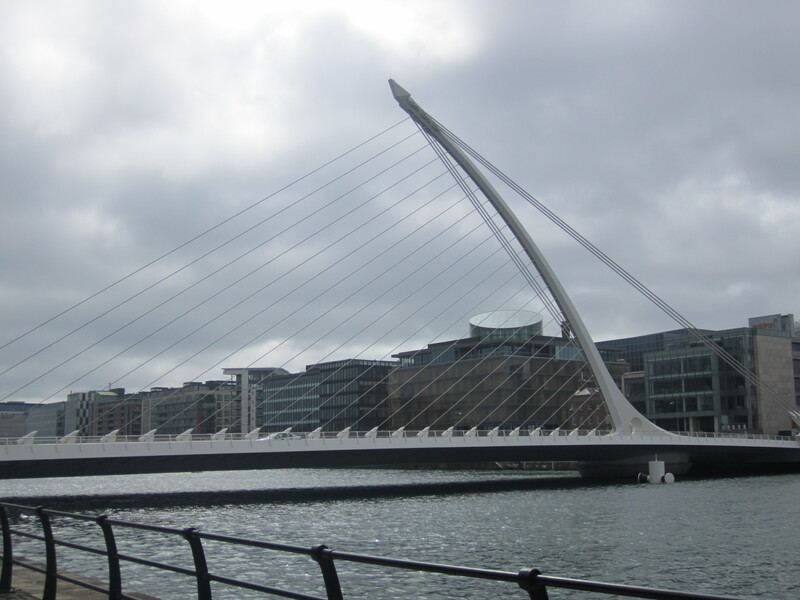 I strolled along the River Liffey toward the docks. I passed many bridges over the Liffey of unique design. 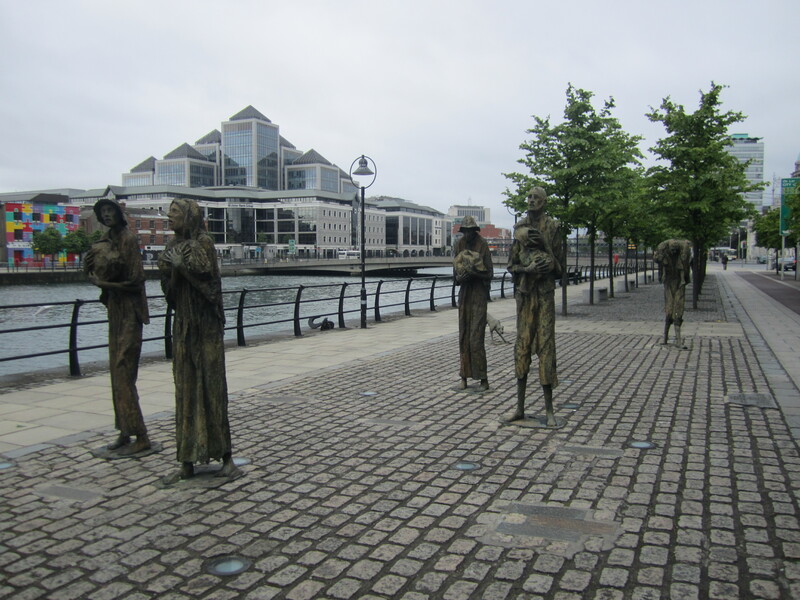 I also saw the Famine Memorial. Very touching. I mention this event in ‘The Keepers of Eire’ as a catalyst for the dragons to take human partners. The city is bustling with preparations for the Queen Mum’s visit which starts Tuesday until Friday. Thankfully, I won’t be there, as I wouldn’t be able to get close enough to see her anyway. So, I’ve had trouble the last day or so of accessing the Internet, even at places like O’Neill’s where I’ve accessed before. I was walking back to try a few posh hotels, when much to my surprise, I found a free WiFi Internet. Bet you can’t guess where? Give up?? McDonald’s. Yep, that’s right, the golden arches (although, there are no arches here, golden or otherwise). That’s how I posted last. This post is actually from Edinburgh, Scotland, UK. It is 5:30 pm and I’ve checked in to my room at the Travelodge and have paid for Internet service for my time here in Scotland. But, I digress- last night I spent my final night at The Celt Pub just next door to wherre I’m staying. The craic was raucous. There were many people in town for the Queen’s visit, including several from Belfast in Northern Ireland. The prevailing hope is nothing unsavory will happen during the visit-Ireland’s economy is still teetering and if anything happened the country might never recover. Lots of money (8 million euro) has been spent on this visit. The up side is that Ireland’s greatest tourism comes from the UK, so the visit could boost the tourism economy here. The people are hopeful, yet wary, of the Queen’s visit and Pres. Obama’s next week. 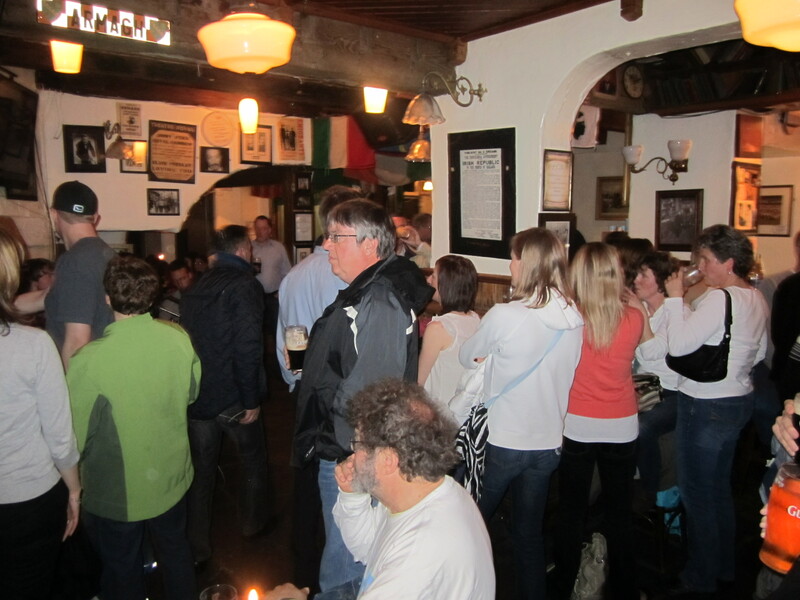 Check out the crowd at The Celt pub. I have some great video clips, but I can’t post here. Well, I’m off to see a bit of Edinburgh and find me some grub.